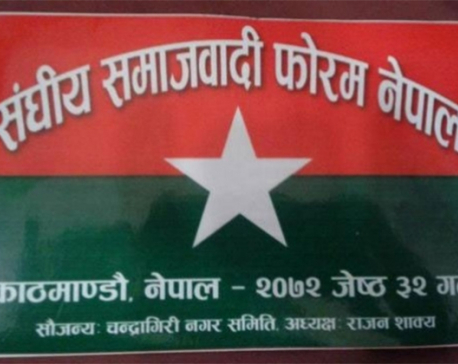 KATHMANDU, Sept 9: Parliament has endorsed the bill to amend the Banking Offenses and Punishment Act 2008, outlawing ‘Dhukuti’ schemes as well as provisioning stricter punishment for banking and financial crimes. The amendment bill, which was finalized by the Finance Committee of Parliament and approved by the full House on Friday, has envisaged a maximum jail sentence of 12 years for serious banking and financial crimes. Similarly, the amendment bill states that ‘Dhukuti’ schemes will become illegal. The bill defines a Dhukuti transaction as collecting money from one another on mutual understanding and using the money on a rotational basis. The punishment for such crime will however be based on the amounts involved and the nature of the particular case. The amendment bill will come into effect after endorsement by the president. “As the trend of using informal channels for savings and credit is growing and many people have been cheated, it is imperative to bring such practices within the ambit of the law,” reads the reasoning of the minister for finance for introducing the measure to curb Dhukuti schemes. The new bill also includes cooperatives under the definition of financial systems, along with informal groups and people involved in mobilizing deposits, public funds and loans. These will also come under the purview of the banking offense and punishment act. The Finance Committee has endorsed the amendment bill with some changes and submitted it in the full House for approval. Following intense debate whether to increase jail sentences for banking and financial crimes to deter the rising instance of ‘white collar crime’ or increase the fines instead, the committee took a middle path. While the punishment has been made more severe compared to under the existing bill, it is more lenient than the original amendment draft proposed by the government. 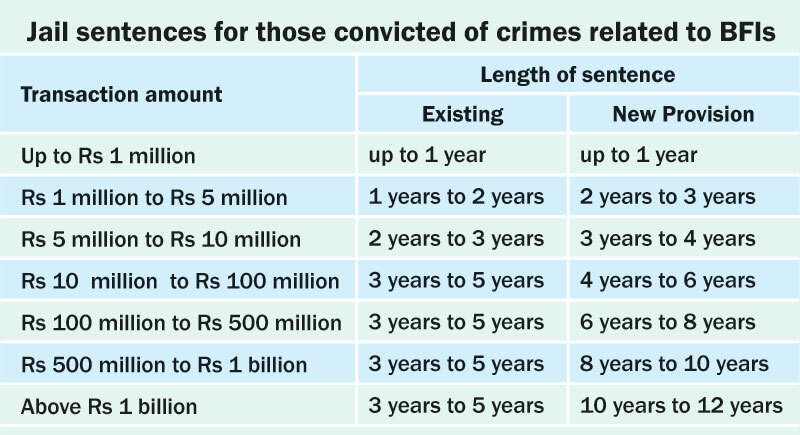 According to provisions in the approved bill, a person convicted of a banking offense involving an amount above Rs 1 billion will have to face imprisonment of 10 to 12 years including forfieture of the amount involved and a fine equivalent to the same amount. Making unauthorized withdrawals or payments from banks and financial institutions, running a Dhukuti scheme, obtaining or making payments through abuse or unauthorized use of electronic means of transaction such as ATM, debit card and credit card, misusing credit facilities availed by a bank or financial institution and causing excess, low or false valuations, among more than a dozen other offenses, will invoke punishment. The new bill has also increased to 60 days from existing 45 days the maximum period that the police can hold under judicial custody a person charged of financial crimes .